I was quite surprised when I went through my old neighbourhood and saw that the cafe "The Meeting Place" had closed down, and was going to be replaced by an Italian cafe. For most of my childhood the site housed a hairdresser, and later on it was bought over by a nice couple from the country and became The Meeting Place. They ran it for a little while, but, bless them, I don't think they were very keen on the whole cafe business. I once asked the lady what time they opened on Saturdays, and she replied, "Aw yeah, it's meant to be 8 o'clock... if I can get up in time!" They sold the business to a family from China, who ran it for quite a few years. They did the standard suburban cafe stuff - decent coffees, sandwiches, cooked breakfasts, and quite a few cakes and biscuits (all bought in). They were friendly and worked really hard to establish their cafe, and business seemed steady, even if customers weren't breaking down the doors. A couple of months ago I drove past and saw the windows all boarded up, with a sign "Pure Italian... cafe coming soon!" I'm not sure what happened to the Chinese family who worked so hard there, but I wish them all the best! I visited Pure Italian with my parents on a Saturday afternoon a week or so after they'd opened, and it was absolutely chockers! I didn't even know we had this many people in North Balwyn! We popped in at about 2pm, and got a table straight away, but it was super-packed and there was a steady stream of customers coming in for the rest of the afternoon. 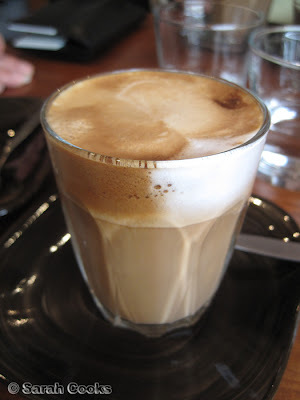 We started off with lattes, which were a little hot and strong for my liking, but otherwise pretty decent. (You can imagine that many of the locals in the exciting area of North Balwyn like their coffees hot hot hot, hehe). They had a menu up on the wall, with items like pan-fried prawns on parmesan polenta ($17.50), lentil soup ($9.50) and pan-fried scotch fillet with roast potatoes & mushrooms ($17.50). They've also got a cabinet up the front with things like arancini, salads, cakes and biscuits. Some Italian gourmet grocery items are available (think olive oil, pasta etc. 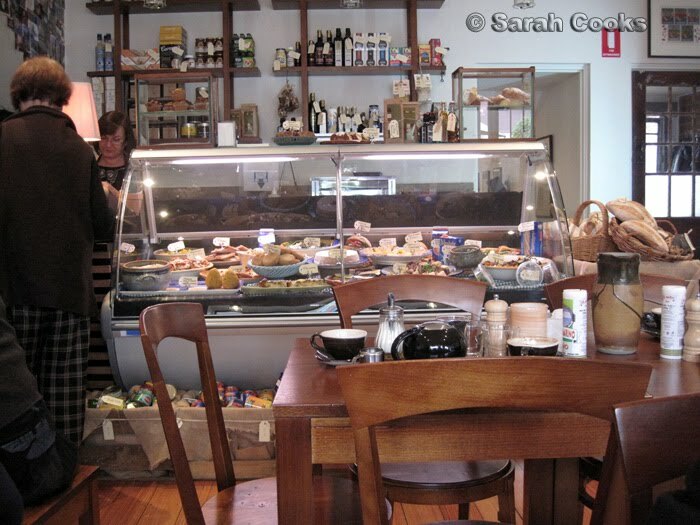 ), and they also sell loaves of bread from the Abbotsford Convent. 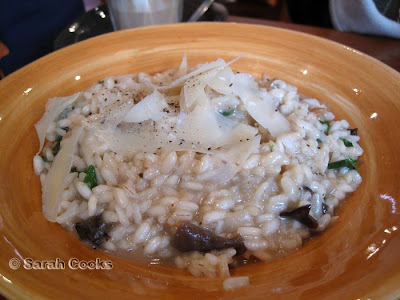 My parents ordered the risotto with forest mushrooms ($15.50) to share. I did better, ordering an eggplant fritelle from the cabinet. It was basically an eggplant fritter, crumbed and fried and dusted with parmesan. 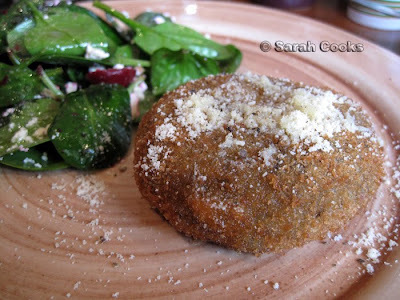 I love eggplant, and I really enjoyed this! The salad that came with had baby spinch, fetta and beetroot, with a nice little crunch from the sea salt in the dressing. As I mentioned, they do have some biscuits and cakes up at the counter, but as we had a Swiss roll waiting at home, we decided to give them a miss. I must make a visit back to try the cakes. The new owners have put a lot of thought and effort into the new venture and have created a place that is clearly a hit with the local neighbourhood. Well done, and I hope they (and the crowds of customers) stick around for a long time! I know where you're talking about! Ahhhh, childhood memories. You know, from the picture of your risotto, the grains actually look like barley, which, still undercooked is gross. I went for lunch and just love it! The Italian family is so friendly and the dishes are really fantastic! Pure italian have been around for a while - they moved from Burke road near the Coles on the corner of doncaster. I just think they're more noticeable now! !